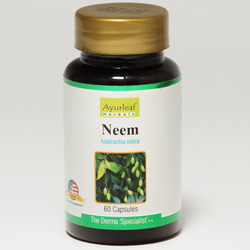 A native medicinal plant of India it is a skin Neem Capsules specialist. It is called Azadirachta Indica l Neem. It grows up to 130 feet high in tropics. All parts of the tree are useful-oil, leaves, fruit, bark, kernel and also gum. Its uses are versatile in nature. - Helps to fight acne by inhibiting the bacteria that causes acne growth. - Helps in alleviating acne-causing bacteria-induced skin inflammation. Neem (Azadirachta indica) has anti-bacterial, anti-fungal & blood purifying properties. It is useful in skin disorders and keeps your skin healthy and glowing all the time. Each capsule contains Freeze Dried Powder of Neem (Azadirachta Indica) 200mg. - In Diabetes Mellitus as an adjuvant therapy. - In all types of skin diseases, especially Psoriasis. 1. Neem is helpful for diabetic. It controls the sugar level of blood. 2. it increase the immunity power against disease.